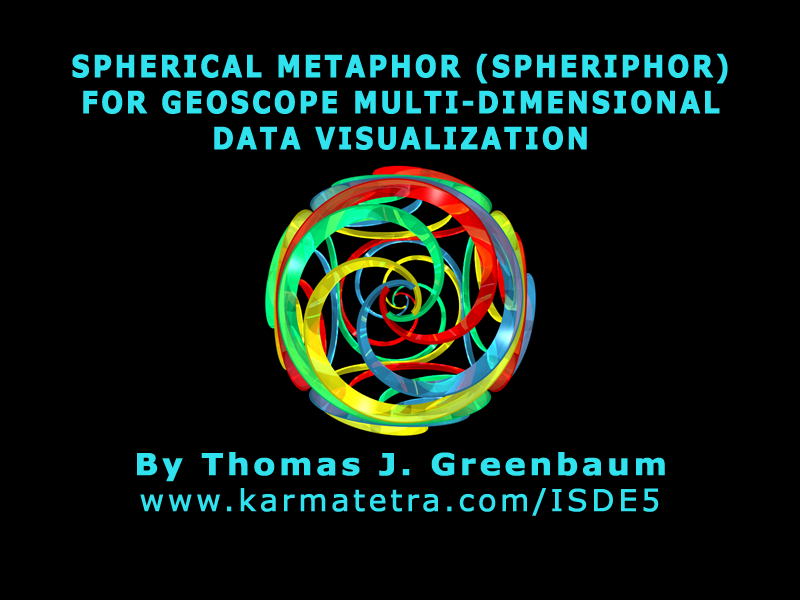 The following images, animated video and 4-page handout illustrates a design science solution entitled SPHERICAL METAPHOR (SPHERIPHOR) FOR GEOSCOPE MULTI-DIMENSIONAL DATA VISUALIZATION. This future technology demonstration is inspired by Buckminster Fuller's concept for a Geoscope. This is one of a series of studies for the creation of a visual metaphor for representing complex data clusters in spherical space. This video presentation was shown as a technology demonstration at the 5th International Symposium on Digital Earth (ISDE5) on June 7, 2007 at the University of California Berkeley. A 4-page foldout presentation is available for download and printing. This handout explains the articulating framework for a fully transportable digital dome with outside-in projector array. Two separate Acrobat PDF files are used to print a two-sided 17"x11" (tabloid) handout which is folded in the middle. One file prints the outside 2 pages and the other file prints the inside 2 pages.